We don’t usually see indie or niche brands tackle strawberry in perfume. The opening of Strawberry Sling is like sipping limoncello in an herb garden. It’s like a sweet, syrupy lemon and mint. It’s also ozonic, like a breeze. Strawberry Sling becomes even more tangy with an addition of juicy strawberries accompanying the tart lemon zest. What I like about Strawberry Sling is that it has greenness from herbs that keep it fresh and “realistic”. It eventually dries down to a refreshing cocktail, or something I wish was a cocktail – brandy, lemons and rose. Strawberry Sling is a happy, bright fragrance. It’s rare to find something like this that isn’t juvenile or reminiscent of drugstore body sprays. It’s a tangy fruity fragrance that is a nice alternative to the classic “eau de cologne” style of citrus. In my opinion, it’d be a great scent for summer or for “day” wear. Totally unisex. Final EauPINION – Limoncello in a strawberry patch. Amber’s goal with Iris Laughs was to create an iris perfume that was joyous (I guess, they usually aren’t??). The opening of Iris Laughs smells exactly like Kedem sparkling concord grape juice. It’s effervescent, fruity. This grape juice accord lasts a lot longer than I expected. Eventually the fragrance becomes more of a cool, green floral. It’s a lemon-y rose, green iris and grape juice. The base is sheer and almost transparent. It’s like iris petals, violets and dried grapevines. The opening reminds me of Evyan White Shoulders (with a bigger budget). The rest of it is an interesting take on the usual fruity-floral. If I had to describe Iris Laughs as a color, I’d describe it as periwinkle – light, pastel but vibrant. Final EauPINION – Sparkling grape juice floral. Projection and longevity of both of these are below average. However, Strawberry Sling is an eau de cologne and wears like one. 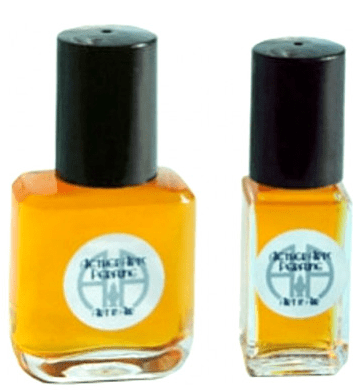 Iris Laughs is a perfume extrait and doesn’t wear like one. These come in a few sizes with the .19 oz bottle retails for $58 at Aether Arts. Samples are also available for purchase.